Oakland’s Khalil Mack is the 1st player ever in NFL history elected as an All-Pro at two different positions (DE & OLB) in the same season. Similarly, in our post, “Do I put off a human vibe to you?” (January 2014), we wrote that the public (and, often, investor’s) imagination can be captured by the extrovert – highly confident, dynamic, charismatic types who are full of outward confidence and whose natural talent or ability seems obvious after a first meeting. We were reminded of the introvert vs. extrovert discussion when reading Robert Klemko’s feature of NFL star Khalil Mack, whom Kelmko contrasts in some detail with Jadeveon Clowney. As many college and NFL fans will remember, former South Carolina star Clowney is an athletic marvel, able to rely on his immense physical gifts to dominate lesser opponents throughout his football career, up until his NFL career began. Every college talent evaluator and NFL draftnik was mesmerized by Clowney’s obvious and immense physical gifts, though fewer paid attention to his work habits, hustle, and understanding of the team concept. Mack, by contrast, was the classic diamond-in-the-rough, overlooked in the college recruiting process because of an injury in high school and his still-developing frame. As college recruiters overlooked Mack, however, he honed his craft in relative obscurity at small school Buffalo, far away from the bright lights and television exposure of the Southeastern Conference, where Clowney played. Far from being discouraged, however, Mack instead focused on honing his craft, paying careful attention to the technique of the position and living in the weight room, whereas Clowney lifted weights infrequently and chose to freelance more during games, confident that his talent (and other less talented teammates) would save him. 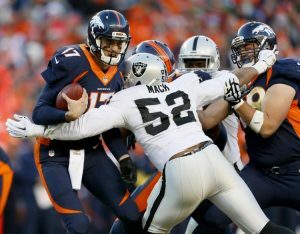 Once the talent evened out in the NFL, however, Mack’s habits have overtaken Clowney’s talent, making Mack, not Clowney, the force to be reckoned with in the pass-happy NFL as a dominant pass rusher. At Ballast Point Ventures, we know that entrepreneurs come in all shapes and sizes, but we too are interested in investing with those entrepreneurs who have persisted when times were difficult and continued to chase their dreams of building their companies, oftentimes far away from the glitzy limelight of Silicon Valley and the associated “unicorn” culture. We know that building a great business takes talent and intelligence, for sure, but hard work and persistence often can carry an entrepreneur when all else evens out. We will continue to look to partner with the Khalil Macks of the world, knowing that they share many of the values that we hold dear and will exhaust every avenue to make their dreams come true.